PLANS have been unveiled for 21,000 new homes to be built across South Oxfordshire by 2033 along with a package of major transport improvements. The proposals, exclusively revealed by the Oxford Mail [April 2017], include more than 8,500 homes at ‘strategic sites’ in Culham, Chalgrove and Berinsfield, 1,350 in Wallingford, Thame and Henley, 1,100 in larger villages and 500 in smaller ones, with 9,369 already in the pipeline - mostly in Didcot. They are due to be published today as part of South Oxfordshire District Council’s latest draft Local Plan, the blueprint for development in the area. The document also says it will provide about 3,750 homes to help tackle Oxford’s housing crisis – fewer than the 4,950 share other authorities have called on it to deliver. Council leader John Cotton said a key part of the new plan was making sure housing developments were accompanied by new roads, schools and other infrastructure. Transport schemes include a new £100m bridge over the River Thames to link Didcot and Culham, the Didcot Northern Perimeter Road, bypasses at Clifton Hampden, Stadhampton, Watlington and Benson, as well as improvements to Culham and Didcot railway stations. Appleford is the village on the LEFT bank. It is said that the Appleford was the ford at which apples from the Harwell Orchards were brought into Oxfordshire. 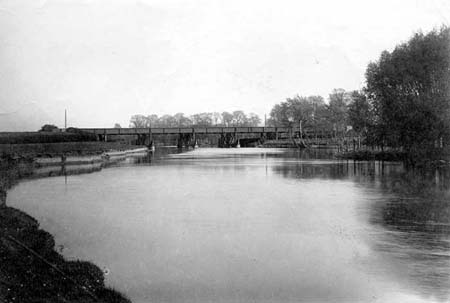 See Nuneham Railway Bridge (Black Bridge), above Abingdon, for a similar history to Appleford Railway Bridge. In December 1843 this forbidding structure was being erected; and was attracting the unfavourable attention of the [Thames] Commissioners. They thought its low height and construction likely to be most injurious to the navigation. For the shallows here I get the title of Appleford Flat; I once saw a youth standing in midstream with the water only to his waist. *Fred was wrong! The bridge he knew was the second bridge out of the three that have been here. The bridges were: 1844-1850? in wood, A timber bridge by Isambard Kingdom Brunel. 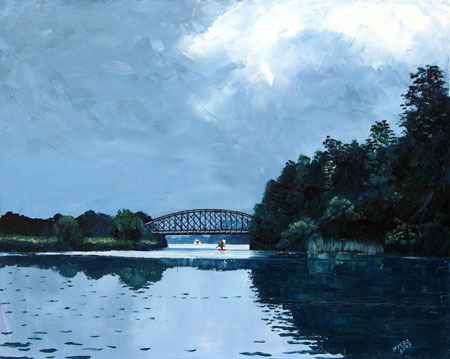 The first railway bridge here was made of timber and opened in 1844. By 1850 it had been replaced by a pair of wrought iron bridges, one for each track. But to allow for the use of heavier locomotives on the line (the main line from London to Oxford) they were in turn replaced in 1927 by the present single steel structure. Has anybody a picture of the 1844-1850 wooden bridge? I can't find one, nor can I find its twin, Nuneham Railway Bridge. A long news article covered the opening of the Didcot to Oxford branch, the highlights of which are included here. It is reported that the journey between Oxford and London which could take up to eight hours by coach was now timetabled as being two hours and twenty minutes by train. The report first covers the official inspection of the line. 'On Monday the government inspector, General Pasley, Mr. Saunders, Mr. Brunel, and some of the directors of the Great Western, with a party of ladies made the first trial run of the new line. The distance from Paddington to Didcot, 53½ miles, was done in the short space of one hour and eight minutes, Mr. Brunel directing the engine. From Didcot to Oxford they travelled more slowly to give the inspector an opportunity of making the necessary survey. The train, however, arrived safely at Oxford about half-past two. The champagne lunch may have swung it as, despite the potentially disastrous incident on Appleford Bridge, the line was passed for public use by the inspector. 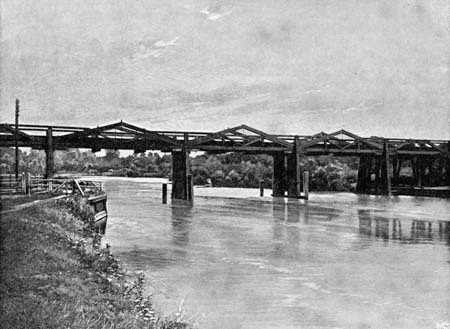 It is presumed that the bridge in question was that over the Thames which, like the Nuneham Bridge, was initially of timber construction. A mile beyond [downstream from Clifton Hampden], the railway crosses the river at the village of Appleford. No part of England can display more secluded pastoral scenery than is here met with; the utmost abundance seems to crown every orchard and garden. The county is agreeably diversified with wood and water; the banks of the river rise to a considerable elevation, and upon their summits many graves of the early Roman and Saxon settlers have been discovered. 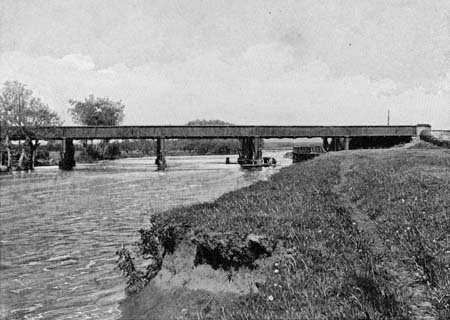 1929: Third Appleford Railway Bridge built. 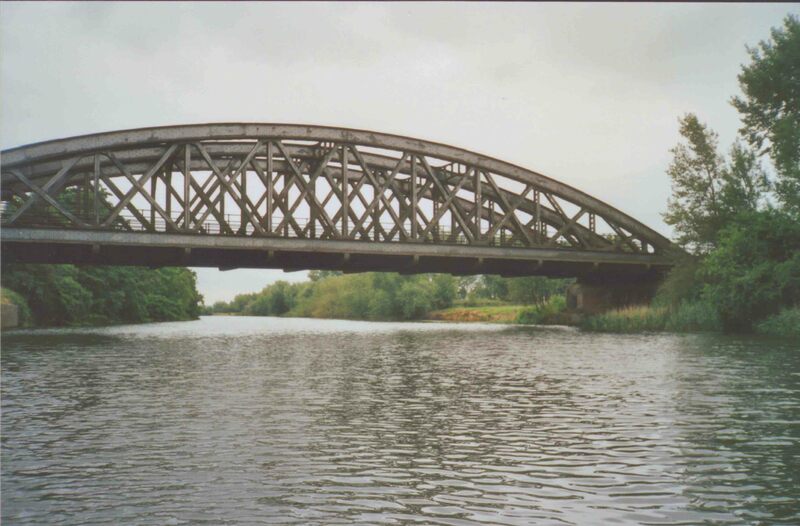 Third Appleford Railway Bridge in 1999.